For the longest time I didn’t eat a lot of cake. I found it really difficult to adapt recipes I knew and loved from my pre-vegan and gluten-free days, and those recipes I tried that were suited to my new dietary requirements were just full of white carbs, processed stuff and sugar, to ‘substitute’ other ingredients. None of which I really wanted to eat on the regular. As you’ll probably know by now if you’ve been reading along, I love my whole food ingredients. And it makes me extra happy when I can make desserts with them that actually taste delicious. 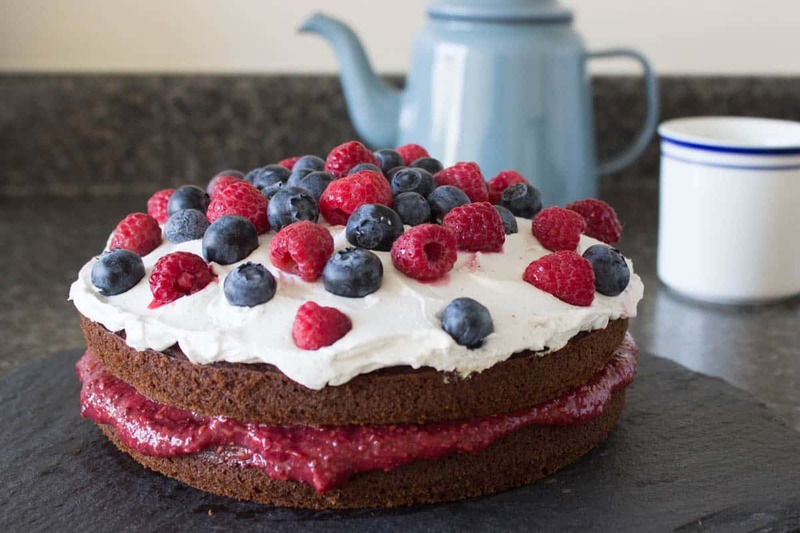 And this Vegan Berry Sponge Cake does. Really. Being a fan of English victoria sponge cakes from my childhood, I took it to friends for afternoon tea and we demolished the whole thing! It’s a satisfying, spongy vanilla cake which when combined with the jam and cream topping is rich and decadent. Sprinkle it with a handful of whatever berries you have lying around and it looks mouthwatering. One note on my ingredient list: when I say ‘applesauce’, I’m referring to apples peeled, stewed for 20 minutes and blended. No added ingredients. You can totally buy it if you like (you can find unsweetened applesauce in the shops) but I tend to make my own as it’s less hassle and cheaper. If you’re going the DIY way, you’ll need about 3 medium-sized apples to get the 1½ cups of applesauce needed for this cake. Preheat the oven to 350°F/175°C. Grease two 18cm cake tins with coconut oil and line the bases with parchment paper. In a large bowl, whisk the flaxseed, coconut oil and maple syrup/coconut nectar until combined. Add the applesauce and almond milk and whisk again for several minutes until the mixture is smooth and airy. Add the coconut sugar, salt, baking soda, ground almonds, rice flour and vanilla and stir until the mixture is combined and lump-free. Divide the mixture evenly between the two cake tins and bake for approximately 45-60 minutes (until a knife comes out of the centre of each cake relatively clean). Turn the cakes out onto a wire rack and leave to cool completely. To make the jam, gently heat the raspberries in a saucepan for about 15-20 minutes, until they are totally broken down. Remove from the heat, stir in the chia and maple syrup and leave the mixture to thicken for 15 minutes. To make the cream topping, chill a large bowl in the freezer for 10 minutes. Using an electric whisk, beat the hardened coconut milk in the bowl with the maple syrup and vanilla until the cream is totally lump-free and fluffy. 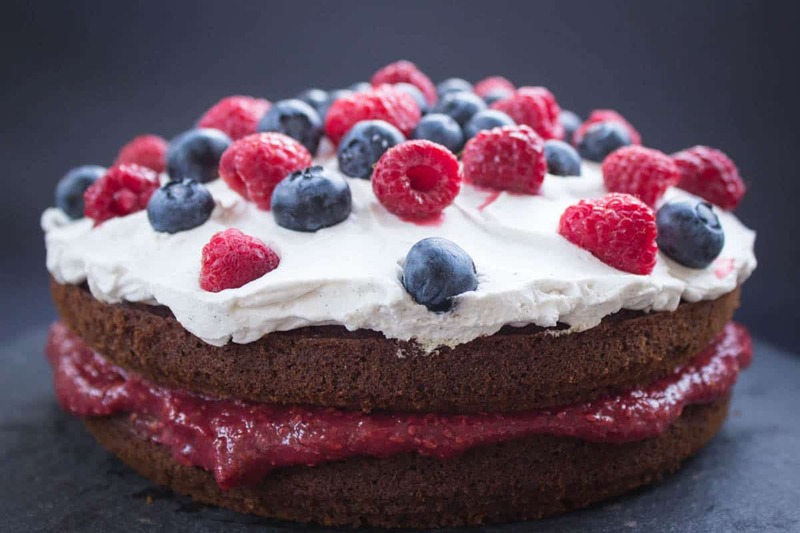 Spread the jam in an even layer on top of one of the cakes, sandwiching the second cake on top of it. 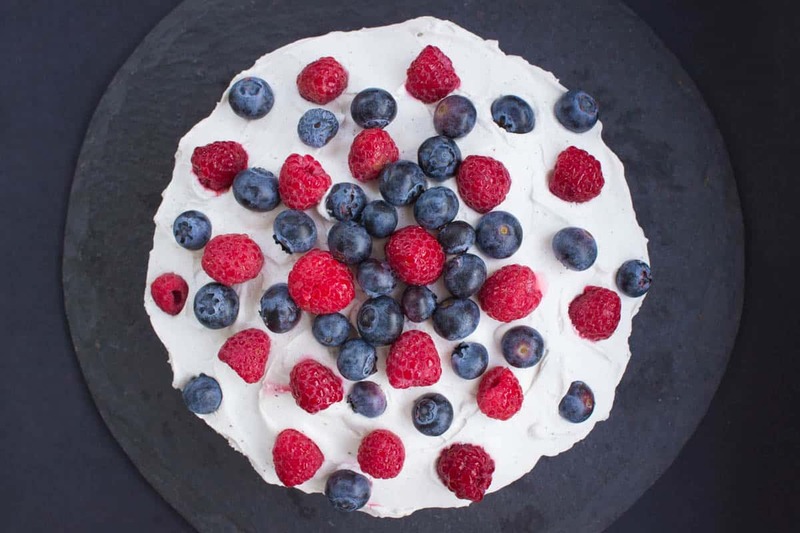 Spread the cream on top of this in a rough layer, and decorate with mixed berries.